It feels like the newest, coolest, and most vibrant part of the city, pulsating with activity, suddenly crammed with tourists — and even longtime Boston residents. The waterfront stretches from the southernmost tip of Dorchester through South Boston, to downtown, the North End, Charlestown, and finally to East Boston. Eighty-five percent of the shore is pedestrian-friendly, part of the groundbreaking public way known as the HarborWalk. Boston’s waterfront has exploded in the public consciousness. It feels like the newest, coolest, and most vibrant part of the city, pulsating with activity, suddenly crammed with tourists — and even longtime Boston residents — who marvel at newly discovered delights around every corner of its 47 miles. 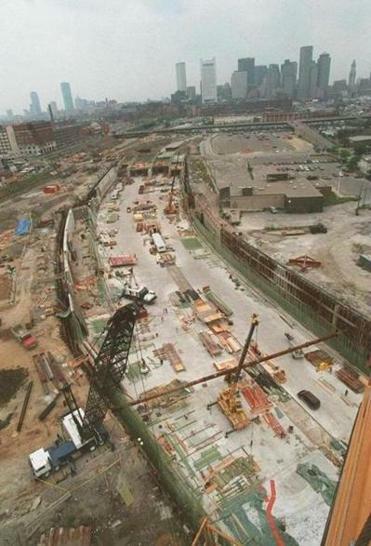 Construction of the Big Dig in 1994. That’s right: 47 miles. 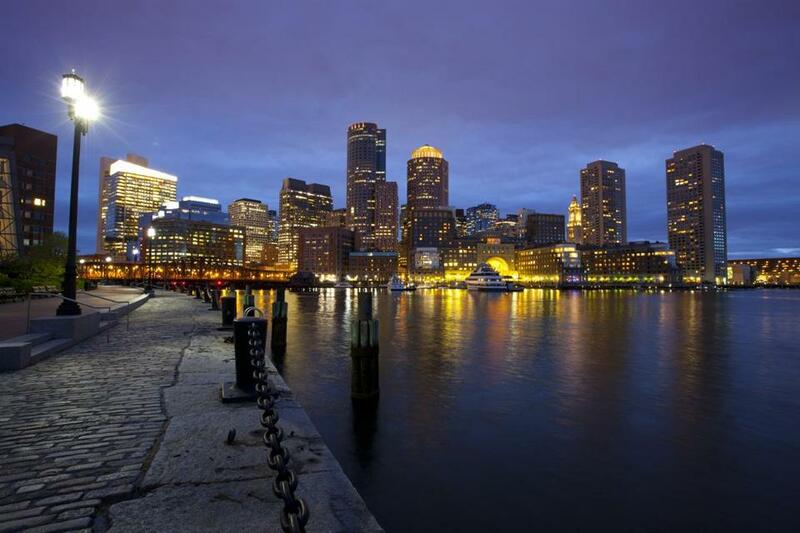 The waterfront stretches from the southernmost tip of Dorchester through South Boston, to downtown, the North End, Charlestown, and finally to East Boston. Eighty-five percent of the shore is pedestrian-friendly, part of the groundbreaking public way known as the HarborWalk. New apartments and condos are popping up everywhere, notably in South Boston, but also, hopefully, East Boston. And the list of attractions along its course is staggering. There are the marquee names (the USS Constitution, the Aquarium, the soon-to-reopen Boston Tea Party Ships & Museum, the Children’s Museum, the Institute of Contemporary Art, and the John F. Kennedy Presidential Library and Museum), parks galore (including the launching point to one of the most stunning of them all, the Boston Harbor Islands National Recreation Area), and myriad smaller amusements (tasting room of Harpoon Brewery, anyone?). And, of course, there are the retailers and restaurants that stretch its length, upscale and everyday, famous chefs and casual cooks. More are slated as eager businessmen and women, sensing money to be made, realize that the waterfront, no longer ignored and neglected, has arrived. It’s been a long time coming. When road builders in the 1950s erected the “highway in the sky” — the elevated expressway — the land they chose lay right along the edge of the harbor. “Waterfront simply wasn’t valued,” says Richard Dimino, Boston’s transportation commissioner from 1985 to 1993 and now head of the business association A Better City. By 1988, the region’s abuse of Boston Harbor — widely known as “the dirtiest harbor in America” — was a national story, an attack line used by Vice President George H.W. Bush that helped derail the White House ambitions of Governor Michael Dukakis. “Two hundred years ago, tea was spilled in this harbor,” Bush said on a chartered boat in Boston that year. “Now it’s something else.” He was, sadly, correct. The harbor was little more than the metropolitan area’s sewer, a dead, stinking zone that repulsed anyone who got near. But making the harbor into a place folks could love didn’t mean they could actually enjoy it. The elevated expressway, unregulated development, and years of mistreatment had left the waterfront almost inaccessible. And landowners along the way had built right up to the water’s edge. So even if people could get to the water, there weren’t many places they could go without hitting a dead end. On a Monday night in late April, several hundred folks gather at the Boston Harbor Hotel at Rowes Wharf for a fund-raiser on behalf of The Boston Harbor Association, one of many advocacy groups that for years fought often lonely battles on behalf of the harbor. The association’s signature issue was the HarborWalk, a project that had its genesis under Mayor Raymond Flynn and focused on one simple goal: Make the entire waterfront accessible to the public. The plan had an element of the quixotic to it (who even cared about the harbor? ), with proponents often belittled as they harangued landowners over something that seemed so inconsequential. But that’s changed, as evidenced by the heavyweight guest list for this event, one that features financiers, developers, and senior government officials. The fund-raiser, billing itself a “celebration,” bubbles with the enthusiasm of those who see a long-sought objective within reach. On a bright Saturday afternoon, I walk portions of the waterfront with the association’s president, Vivien Li. The HarborWalk is filled with pedestrians and bicyclists. Families picnic. Couples stroll hand in hand. Li points out the new headquarters for Vertex Pharmaceuticals, two 18-story buildings under construction near the ICA; empty sites ready for hotels and housing; and the location of the $5.5 million Boston Innovation Center, which would have its groundbreaking on May 1. The Rose Fitzgerald Kennedy Greenway today. The HarborWalk is one critical piece of infrastructure that helps make the waterfront accessible, but certainly not the only one. 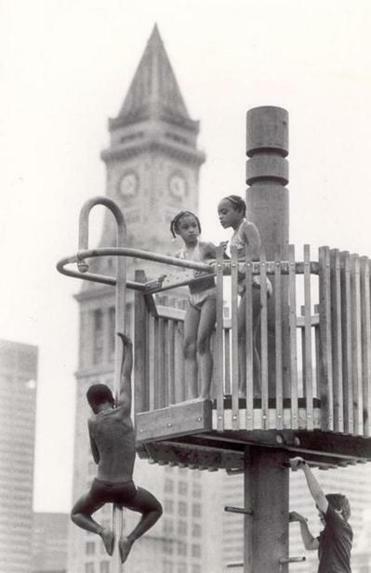 The most visible efforts, in fact, were the tearing down of the elevated expressway in 2003 and 2004 and the construction of the Rose Fitzgerald Kennedy Greenway. Where once there was a huge, green barrier (Mayor Thomas Menino used to call it “Boston’s other green monster”), now clean water beckons, aided by the city’s own “crossroads initiative” to reconnect its streets to the shoreline. Then, too, there is the much-mocked Silver Line, a mass-transit link between Logan International Airport and South Station. The stations on the South Boston Waterfront initially seemed oversize and unneeded. Now, as cranes loom above them, they are better understood as a lure attracting billions of dollars in investment. There are still risks. Development is concentrated on the South Boston Waterfront, but while the money is largely in place, another financial crisis like the one in 2008 could derail everything. 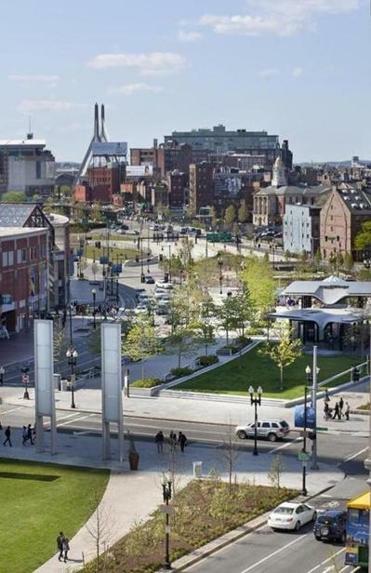 The city has big ideas for new dwellings in East Boston, but they are still dreams that depend, in part, on a successful rollout of a water shuttle that would connect Maverick Square to Fan Pier. And there is a kind of chicken-and-egg problem that confronts the creation of any neighborhood. People are attracted to areas where there are basic amenities — supermarkets, for example. But those amenities won’t open until there are actually new residents. Residents and retailers both need to make a leap of faith. Nevertheless, it seems clear that Boston’s center of gravity is shifting, moving away from Back Bay and downtown and toward the harbor. There is something about the water that stirs the soul, and it is remarkable how for so long Boston had figuratively turned its back on that water. Today, the city is reorienting itself. The BRA has suffered its slings and arrows; it is still, one BRA planner laments, “haunted by the West End,” the tragic decision to demolish an entire neighborhood during the 1950s era of urban renewal. The waterfront, a series of new neighborhoods unfolding before us, may well exorcise those ghosts. A back-of-the-envelope accounting of the public investment in the waterfront. Building the Deer Island Sewage Treatment Plant and its related systems. Other work to improve water quality in Boston Harbor. The Big Dig, including dismantling the elevated expressway, excavating the tunnels, and building the Greenway. Estimated interest on the Big Dig’s bill, set to be paid off in 2038. Tom Keane is a regular contributor to the Globe. Send comments to magazine@globe.com.